#6: Without goals, targets and desires, what’s the point? Today is a great day for me. Today I checked off one of my major riding goals in less than 5 months. Sorry to jump into the present when I have been writing about the past journey and things learnt, but the comments and thoughts of things that occurred in the past have reached fulfilment today. When I bought my bike (bike purchase blog story coming soon), my brother suggested we could go on a fund raiser later in the year which was a 2 day ride, 100kms (60 miles) each way, basically out and back from Sydney. After doing some research, I decided not to do the ride but kept the target – and that was to ride 2 consecutive cycling days of 100kms. And that was in April. In July, I achieved half the goal. I had been increasing my distances each weekend until one weekend I rode 103kms on a mostly flat ride to the south of Sydney. 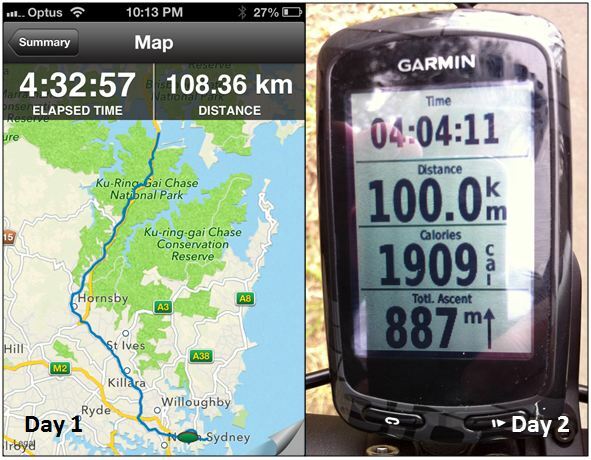 Suitably motivated and believing in myself, the next weekend I rode 100kms on a hilly ride north of Sydney. Since then, with the goal in mind, I have been piecing together hilly and flat rides, totaling 156kms and 171kms on the weekend until yesterday, when I conquered a long ride from home, up a major hill (for me at least) and returned, totaling 108kms. Now it’s September. I had a 100+km Saturday ride under my belt, a free day on Sunday ready for more riding and I felt good.